When the Elements Quartet asked me to write a piece inspired by a photograph, I immediately thought of one I have had since I was a child. It was taken in Greenwich Village in my grandparents' Sullivan Street apartment, which I have only seen in photos. In the short quartet inspired by the photo, the second violin plays a nostalgic melody, while the other strings pluck their instruments in a guitar-like manner. This solo is obviously the boy violinist singing through his instrument. After the melody is completed, however, the first violin enters, muted, in the very highest register. In my mind, he was playing the dream that my eight-year-old father must have had — of performing roulades and high, virtuosic, musing passages that were still impossible for him to master. 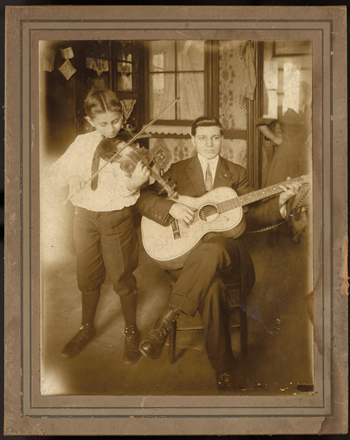 This young violinist grew into a great soloist — my father, John Corigliano, concertmaster of the New York Philharmonic for over a quarter century. He, as an adult, performed the concerti and solos that as a child he could only imagine. The two violins, boy and dream, join together at the end as the guitar sounds play on.